The following steps will show you how to enable a mailing list server on your DV Manged server. 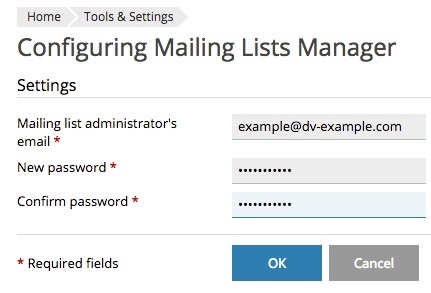 The following steps will show you how to enable a mailing list server on the DV server. Find the Server Management panel on the left and select Tools & Settings. Select Set Up Mailing Lists Server from the Mail column. If this option is not available, this means that the Mailing Lists Server has already been configured. Enter your information and click the OK button. Mailing list administrator's email: Enter the email address for your mailing list manager. New password: This is not the password for your email account. This is the password to manage the mailing list. Be sure to use a strong password. You should receive a confirmation message that the mailing list server has been set up.